United States Grand Prix: Can Hamilton wrap up title at 'little jewel' Austin? 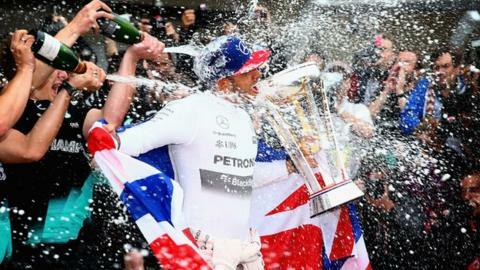 The champagne flowed in Austin after Hamilton's 2015 title win... can he do it again this weekend? The United States Grand Prix could be the race at which Lewis Hamilton wins his fourth world title. It's not likely - Hamilton needs to score 16 more points than Sebastian Vettel to do it - but the way things have been going for Ferrari in recent races, it cannot be ruled out. Vettel and Ferrari's season has collapsed in spectacular fashion over the three Asian races in Singapore, Malaysia and Japan, and the team and driver have only themselves to blame. The German triggered the start-line crash that took out himself, team-mate Kimi Raikkonen and Red Bull's Max Verstappen at the start in Singapore, and then Ferrari's reliability went south in Malaysia and Japan. The good news for Vettel is that if he can just get through this weekend and stay in the game, the next race in Mexico could give him a chance to keep things alive for even longer. The bad news for him is that, unlike Mexico City, the Circuit of the Americas in Austin, Texas, is not a track Mercedes especially fear. They don't expect to dominate, but they feel they should at least be competitive - although if the weather remains as forecast at around 30C ambient, that might change. Cota, as they call it, is a rare new track in F1 where the architects have got things absolutely right. It has a bit of everything and is a great place to watch racing, as well as a challenge for the drivers. It is arguably the best new circuit to emerge on to the calendar in 20 years, but there is more to the success of the latest iteration of the US Grand Prix than that. As a package, the weekend is difficult to beat. Ask anyone in F1 what are their favourite races and you can guarantee that Austin is right up there. The track is excellent, the crowd is large, knowledgeable, warm and enthusiastic, and it is all held down the road from one of the most enjoyable cities in America. Austin might not have the glamour and cachet of New York or Los Angeles but it is a terrific little place - and about as far from the cliched image of Texas as you can get. Yes, just outside it there are Western stores and trailer parks, big skies and big horizons - and all that is wonderful in itself. But the city itself is a little jewel - cosmopolitan, vibrant, atmospheric, packed full of restaurants and bars and with live music all over town. It's not perfect, of course. The traffic can be pretty bad - but at least you can usually enjoy a glorious Texas sunset while you're sitting in it. First to say hello from Austin on social media is Red Bull's Daniel Ricciardo. The city has several murals and street art exhibits and is a definite hot-spot for Instagram lovers everywhere. Keep your eyes peeled on Fernando Alonso this weekend. The McLaren driver will be sporting the same helmet he wore during his run in the Indianapolis 500 in May. F1 drivers are allowed to change their colours one race per season, with Alonso choosing the grand prix in Austin as a way to say thank you to American fans for their support. Another important title has already been decided in Austin in the last few weeks. Step forward Jason Kiley, who was crowned 'Best in Show' at the 2017 World Beard and Moustache Championships in September. The event is hosted by the Austin Facial Hair Club and has multiple-categories including: Hungarian moustache, Garibaldi full beard and Alaskan Whaler.